Likewise the UAA is a strong conference in other sports, just not football, where only 5 schools sponsor the sport and UofR decided that the Liberty League made more sense for it in football. Hopkins also was a charter UAA member, but never competed in football. Like CWRU originally, it didn't play a double round robin in hoops either. CWRU did play double round robin in hoops in NCAC until it went to 10 teams in 2000. The charter NCAC was Allegheny, CWRU, Denison, Kenyon, Oberlin, OWU, and Wooster. OWU and Kenyon each have scheduled 3 UAA teams in 08 and 09. The similarities between NCAC and UAA are greater than the differences. From what I understand Tufts is more like UAA schools than NESCAC as well. Hiram has been a gypsy having been in OAC, PAC, and NCAC. The UAA hasn't been kind to them either, CMU beat them 44-0 and 45-0 the last 2 years. My query was in response to the sentiment on the NCAC board that here wasn't much in the agreement for the NCAC teams. The carrot of a second AQ was to give a reason for the NCAC teams to stick with the UAA and going to 6 conference games to give flexibility to keep traditional rivals or to add diversity. I don't have any insight into why Earlham didn't play along. All of this is driven by the limitations of UAA football. The UAA competes on the national level in many sports, and CMU had several playoff appearances in football in the 8 team days. They even had a win over Dayton, so it is possible for the teams to compete at that level in football again. The UAA has always struck me as a rather loose alliance, probably because their members were dual members in other conferences for a time. Maybe it's a tighter coalition now; I wouldn't know. There is no second AQ in the offing with the current NCAC/UAA scheduling arrangement. As I understand it, the four western football-playing UAA schools would have to be members of the NCAC (bringing that conference to 14 members) for that to be a possibility. I don't think that's very likely at all. 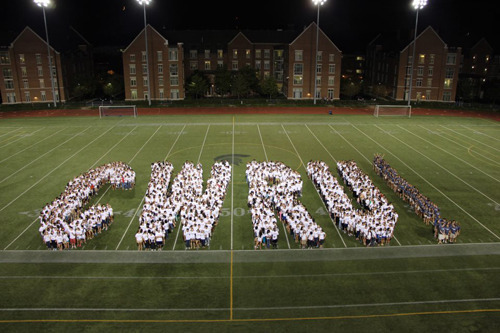 CMU and CWRU would probably be welcomed with open arms, but Chicago and (especially) WashU are a long, long way from Hiram, OH and Meadville, PA. I doubt that the NCAC prexies would want to stretch their athletic travel budgets to that extent. They might be swayed by the prestige of being affiliated with two of the most prominent universities in the country, but I don't think they'd be swayed by the possibility of a second playoff berth. Just my 2c. Go back to page 1 and see my first post on this topic. I proposed 2 7-team football only conferences, out of the 14. 1) I don't think there would be two 7-team conferences independent of one another, because I don't think any of the current NCAC teams would be interested in separating from the NCAC, and because I don't think the NCAC would allow any members to drop out for football (permanently) and stay in for all other sports. The E/N is a reasonable alignment, but there's a lot of travel time in that W/S division, especially for Kenyon (or, if you prefer, Denison.) And most especially for WashU, but of course it's still less travel than what they are accustomed to. Furthermore, I'd expect the NCAC to schedule a "super-conference" with something like 6 intra-division, 2 inter-division, and 2 non-conference games. That adds one trip from eastern Ohio or western Penna to St. Louis and another to Chicago each season (and vice-versa). I could be wrong (as in all things), but I can't see the NCAC presidents approving this. But it'd be interesting, that's for sure! In my thinking I switched OWU and Denison from your alignment mostly for competitive balance. If you take out the inter-conference games the longest travel for NCAC teams would be central Ohio to StL or Meadville. I would not count inter-conference games for standings and those would be used to maintain rivalries and a UAA round robin. Wabash would lose trips to NE Ohio and W Pa, unless it chose to keep those games. True 2 central Ohio teams would travel to Chi and StL every other year, but they lose the Meadville trip. Those teams would go from being in the center of a conference to being on one end. You make good points, 70. Maybe this is more plausible that I first thought. I wish I could go back in time and reconstruct the decision process that let Wabash into the NCAC. That was a school that is geographically remote from most of the other conference members, and doesn't fit with (supposedly) key aspects of the conference's stated "mission" (to say the least! ), and yet they were admitted. If Wabash is a fit, why not WUSTL? Hmm. DC - I think Wabash has many more things in common with the NCAC members than Wash U. does. Also, don't forget that there was a fear that the NCAC could lose it's automatic bid after Case left, with Oberlin and Kenyon's football program teetering on the brink. Adding Wabash basically guaranteed they would never fall below AC status. I don't think that the UAA schools consider themselves fits for "lesser" academic conferences like the NCAC (or the SCAC, or any other conference). And I don't think that being in a conference that gets a Pool A is much of a motivator for them to compromise those standards. I just don't understand why Brandeis is in and MIT is not. To me, that makes no sense. I don't think UAA sees itself as necessarily better than NCAC or SCAC, just different. As has been said they are research universities where the undergraduate schools are only part of the campus. Tufts, MIT, and Johns Hopkins are the only others that I could see as akin to the UAA schools. I don't know why MIT isn't there. I don't know which came first, CWRU's decision to leave or Wabash's entry. I know there would have still been 8 teams without Wabash. Since CWRU continued to play round robin in hoops after UAA was formed, it suggests a commitment to staying in the NCAC, unless they had to play 7 games to stay in for football. Wabash is separated from the center of the conference geographically and one of NCAC's missions, gender equality, doesn't come up there. CWRU pulled out - then Wabash and Hiram were escorted in. Wabash had to wait a year before joining and two for football because of the scheduling issues. Now while a NCAC / UAA 'conglomerate' may not be workable, could you see other conferences that are in "B" try to do this? Personally, I'd like to get rid of "B" all together. My research confirms your timeline. Take the best 32 regardless? The top 8 in 4 regions? The top 4 in 8 regions (ala hoops)? We all have too much time on our hands if we're talking this during the season. That depends on what you mean by "the season!" For some of us, "the season" begins in November. Oh, DC - just because we smacked you around this afternoon doesn't mean there's not room for you on the NCAC football board!